Attention Fire Service Instructors: Special Multidiscipline TIM Train the Trainer Course Offered at the National Fire Academy. Train the Trainer (T-t-T) course for Traffic Incident Management (TIM Course T-0690) is being offered at the National Fire Academy (NFA) in Emmitsburg, MD June 27 to June 29, 2014 for Certified State Fire Service Instructors and/or Metro Fire Department Training Division Members as well as roadway incident trainers from other disciplines. 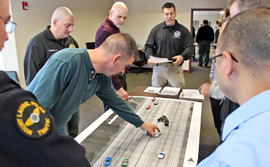 The opportunity to become a recognized TIM trainer is sponsored by the Federal Highway Administration (FHWA) and hosted by the National Fire Academy (NFA). This is the initial offering of the course at this prestigious institution and is a first for multiple public safety disciplines attending an NFA hosted course on campus. Travel, lodging and course materials are all covered minimizing agency expense. The TIM course supports the 16 Life Safety Initiatives (Everyone Goes Home) by setting standardized response actions geared to prevent harm to first responders. The program facilitates intra-agency operability and communications eliminating on scene disagreements and facilitating quicker mitigation and clearance. The Job Performance Requirements (JPRs) of Draft NFPA 1091 Standard for Traffic Control Incident Management Professional Qualifications are reflected in the TtT course. Registration preference is for State Certified Fire Instructors and/or Members of Metro Fire Department Training Divisions. Interested instructors should download registration information from this article.